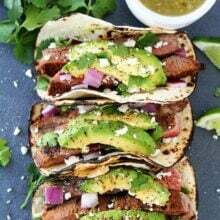 Grilled Steak Tacos with with red onion, avocado, cilantro, and queso fresco are great for Taco Tuesday or any summer day! Use flank steak. 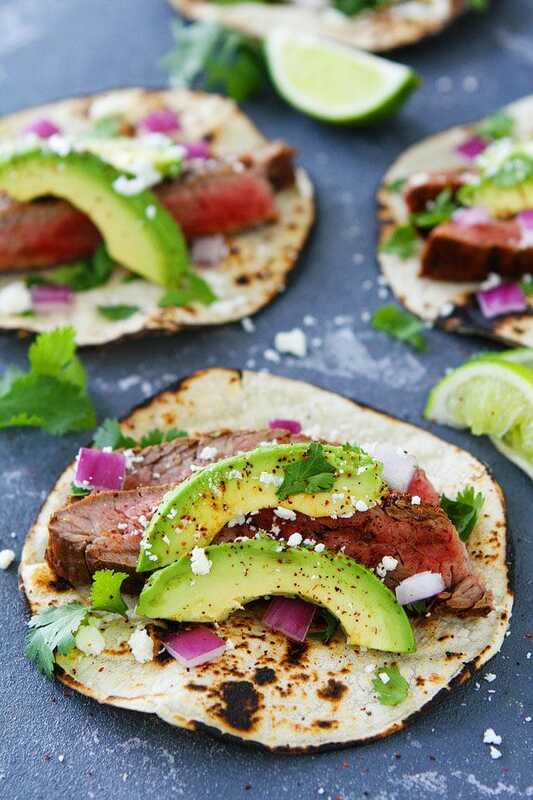 It is a lean cut of beef and is best when cooked to medium rare and thinly sliced, making it perfect for tacos. Only marinate the steak in lime juice for 30 minutes or the steak will get mushy. This is a quick and easy recipe, you don’t have to marinate the steak for hours. The chili lime rub is easy to prepare and uses ingredients that you probably have in your pantry. Grill the steak at high heat. Allow the steak to rest for 10 minutes before slicing so you don’t lose all of the juice and flavor. Cut the steak across the grain. It will be tough and chewy unless you cut it across the grain to break up the muscle fibers. Serve the steak tacos with your favorite toppings. We use red onion, avocado slices, cilantro, and queso fresco. Boom! Are you ready to grill some tacos? If you can’t wait until Tuesday, I completely understand. Tacos are welcome any day of the week! 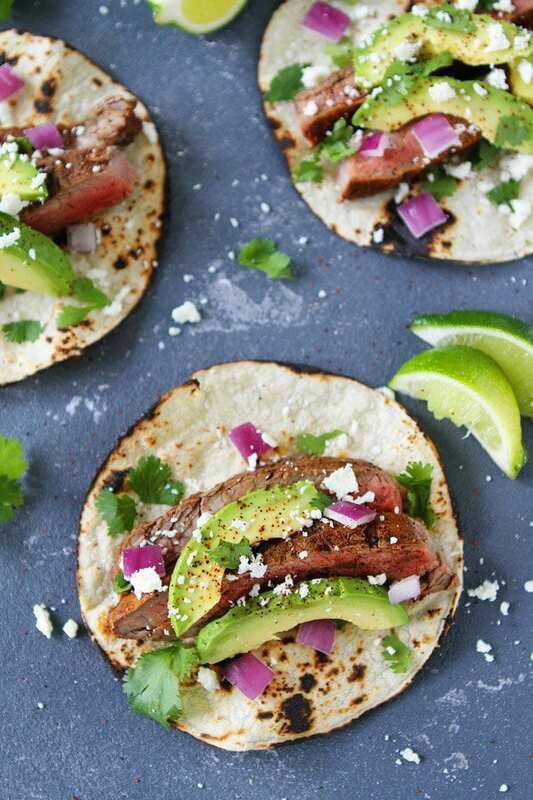 These Grilled Chili Lime Steak Tacos are always a hit at our house and make a great summer meal. Eat them outside on the patio and they will taste even better:) Enjoy! 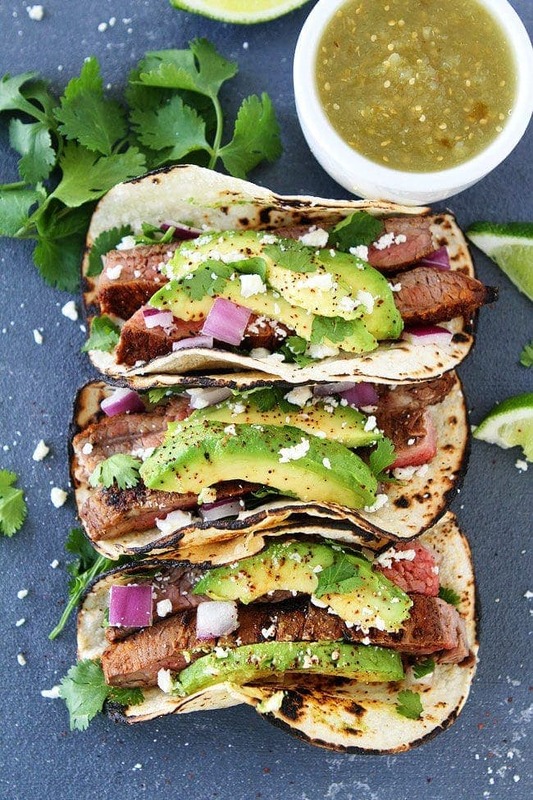 Grilled Chili Lime Steak tacos with avocado, red onion, cilantro, and queso fresco make a great summer dinner! Place the flank steak in a 9x13 pan. Pour lime juice over the steak and let marinate for 30 minutes, at room temperature. Meanwhile, in a small bowl, combine lime zest, salt, sugar, pepper, chili powder, cumin, paprika, garlic powder, oregano, and cinnamon. Rub both sides of the steak with the spice mixture, pressing with your fingers to help the rub adhere to the meat. Preheat grill to high heat. Lightly coat a paper towel with oil and, holding it with long tongs, carefully rub the oiled towel over the grill rack. Place steak directly on the grill and cook for 5 minutes on each side. Remove from grill and let the steak rest on a cutting board, covered with foil, for 10 minutes. 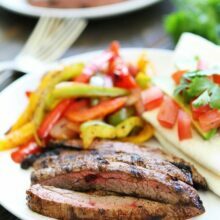 While the steak is resting, warm the corn tortillas on the grill or use a gas flame to char them slightly. Cut the steak into strips, against the grain. 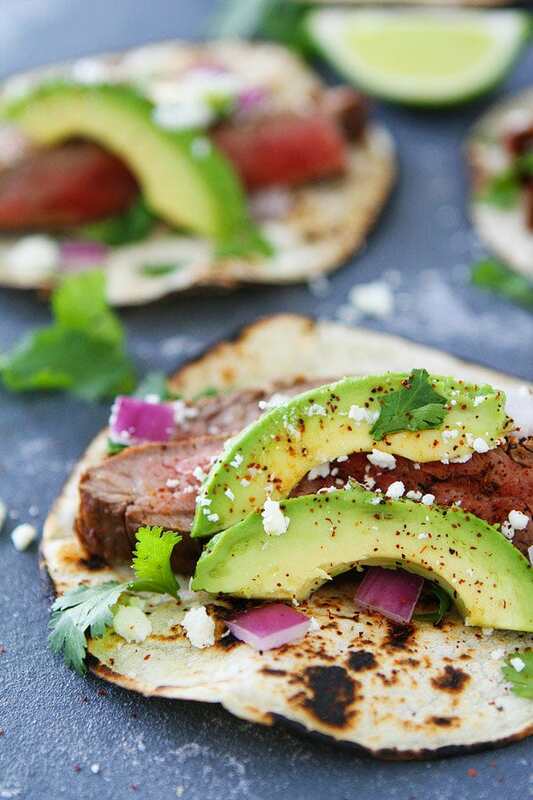 Place steak strips in the corn tortillas and top with red onion, avocado, cilantro, and queso fresco. Squeeze with lime juice, if desired. Serve warm. These are gorgeous and look like perfect Summer grilling! This looks amazing! Flank steak is always great for grilling. You can also try flap steak, it’s very similar to flank and it’s fantastic for stir frying if you don’t have a grill at home. 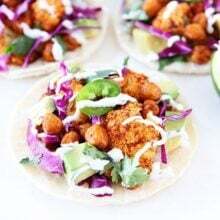 I definitely need these for Taco Tuesday this week! Just in time for Taco Tuesday! Although I seldom actually wait for Tuesday when I see a recipe like this. These are beautiful! 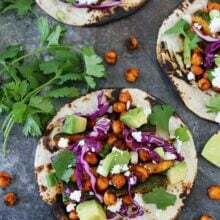 I can hear these tacos calling to me! These look amazing! I need them in my life! They look so good! 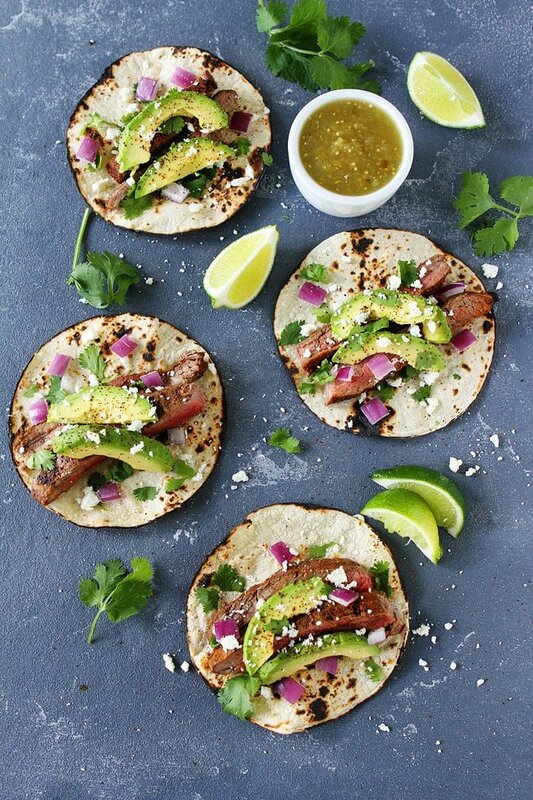 I am obsessed with pickled red onions right now, and I would totally add those to these tacos. Okay, now I’m SUPER excited for Taco Tuesday tomorrow. These look SO good, and are a welcome change from the usual ground beef or chicken! 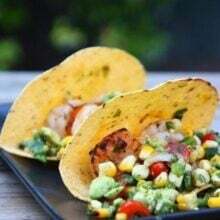 These are my kind of tacos! Do you have a recipe for the salsa pictured? Tomatillo possibly? I am sharing a tomatillo recipe soon! Stay tuned! Yeah wheres the recipe for the tomatillo salsa that is pictured? I will post a recipe soon since there is interest. Stay tuned! I’m a big fan of taco night! This chili lime rub sounds phenomenal! Is a cast iron skillet an acceptable cooking alternative? This looks delicious. It I don’t have a grill or grill pan. Could you cook the flank steak on a Traeger? How long and what temp would you suggest? We are making this for dinner tomorrow night for company on our marvelous Traeger! I made these for my wife and they were delicious. Very easy and super tasty! Looks Yummy!! I can’t wait to try it. Made this several times, one of my favorites! So much flavor. The ingredients list calls for garlic powder but I don’t see it being used anywhere in the recipe? Also where is the cilantro in the ingredients list? Every day is taco Tuesday. These look really good. I have made this a couple times and we love love it! Thanks so much! I need me some steak tacos! The marinade is going to make these so tender and flavorful. Looking forward to enjoy a few (or many!) I might toss in a habanero pepper for a bit more heat. Love it! I made these last week and we are making them again tonight! SOOOO delicious!! My whole family loved them. Thank you for the amazing recipe! I saw fresh corn tortillas in the super market on the weekend and it’s like I was destined to make this receipt. We had taco Monday tonight. The steak seasoning was awesome and 10 minutes per side was just perfect for a tender medium rare. My only critique was that the corn tortillas were too hard to fold done on the grill. Other than that, these were fantastic!